I’m one of those moms who believe children (and people in general) need a routine. We just tend to function better. In being a therapist previously, I have seen first hand how building a routine can be quite helpful in ones environment, achievement, and over-all health. I’m not saying that everyone needs to be strict on an exact regiment. No. That would not be considered healthy. We also need spontaneity in our lives. 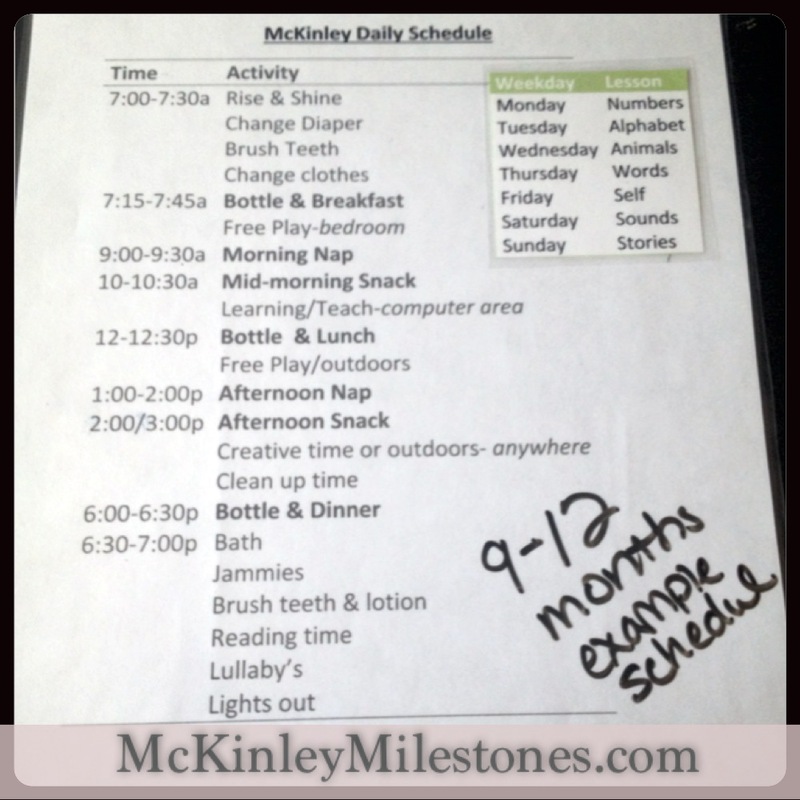 I spent 30 minutes and typed up a daily schedule for Mckinley being sure to give her a variety in activities and spaces. I applied the E.A.S.Y method as well (I have since her birth). Then I printed it out and laminated it. I put it up where I could see as a reminder. No, I did not stick to it every minute of every day…it’s just meant to be a guide. A great read for parents is: The baby whisperer solves all your problems by Tracy Hogg. She explains the E.A.S.Y. method- and many other helpful tips for parents having trouble with sleeping and feeding. Y is for you time. This method helped me get McKinley to switch her nights to her days when she was a newborn, and helped me get her on a 12 hour sleeping schedule at night. I’m a big list person as well. I’ve also done this planning with our kids. We’ve drifted away from it after each new baby then eventually formed a new daily plan. I actually just did a new one 2 weeks ago. It’s pretty ‘loose’ since I have 3 kids across different ages ad we’re in the midst of moving, but at least it’s a starting place to get us back on track. Thanks! This will be my 21st move, 3rd move since having kids. These are all great tips and we do all of these every time we move…with the exception of paying for movers. I’m too cheap! Lol! Wow 21 times!! A lot of moves under your belt. You must be a master at adapting by now 🙂 More power to guys not paying for movers-truly awing! Im to lazy – sad, but true. Happy moving to you & your beautiful family! Yeah, I can see how not everybody would fit into the category of operating at their best with a routine. Some people need structure and others need to go with the flow. I would probably have a meltdown too without a “to do list” ! 🙂 It sounds like your diary, calendar, and setting goals for the week gives you a sense of order. I suppose thats what we need then, a sense of order in our lives. Thanks kindly for sharing Stacey! Come back and visit soon!